In an Instagram post on Tuesday, Wilshere – who came through Arsenal’s academy and made his first-team debut for the club in 2008 at the age of 16, confirmed he was ending his lengthy stint at Emirates Stadium with reluctance. However, the midfielder said he felt he was “ultimately left with little choice” after multiple conversations with the club and new manager Unai Emery over his future. 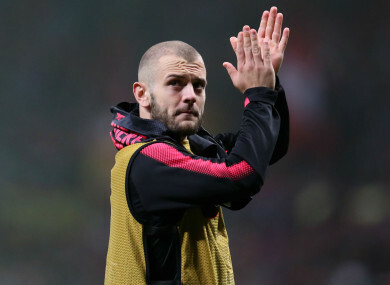 Wilshere made only 12 starts and eight substitute appearances in the Premier League during Arsene Wenger’s final season in charge and duly missed out on a place in England’s World Cup squad. In a post accompanied by the message ‘Thanks for the memories’, Wilshere wrote: “I can confirm that I will be leaving Arsenal Football Club when my contract expires at the end of June. “As has widely been reported I, along with my representative, have been in talks with the club for a number of months with the view to signing a new contract to extend my stay at the Emirates. Such was my desire to stay that I had in fact recently agreed to sign a financially reduced contract in order to commit my future to the club. Wilshere has not represented England since their humiliating exit from Euro 2016 at the hands of Iceland, but retained hope of making Gareth Southgate’s 23-man party for the World Cup in Russia. Wilshere later posted the following video to Instagram, containing some of his favourite memories in Arsenal red. Email “Wilshere 'ultimately left with little choice' as he confirms Arsenal exit after 17 years”. Feedback on “Wilshere 'ultimately left with little choice' as he confirms Arsenal exit after 17 years”.